Sen. John Barrasso, Republican of Wyoming, released draft legislation Monday to significantly overhaul the Endangered Species Act (ESA). Under Barrasso's proposal, individual states would be given key authority over the federal program to conserve threatened and endangered species. "When it comes to the Endangered Species Act, the status quo is not good enough," the Environment and Public Works Committee Chairman said in a press release. "We must do more than just keep listed species on life support—we need to see them recovered. This draft legislation will increase state and local input and improve transparency in the listing process." The Endangered Species Act, passed by Congress four decades ago, is the nation's safety net for fish, plants and wildlife on the brink of extinction. More than 99 percent of species that have been designated for federal protection continue to exist in the wild today, including the bald eagle, grizzly bear, the leatherback sea turtle and the Florida manatee. Many Republicans have long sought to weaken the landmark conservation law, as it can block energy production or other developments on critical habitat for endangered species. The current GOP-controlled 115th Congress has introduced dozens of bills that would strip federal protections for specific threatened species or undermine the ESA, according an analysis from the Center for Biological Diversity. That's one such bill every six days in 2017 alone. Earthjustice anticipated Barrasso's legislative proposal more than a year ago. 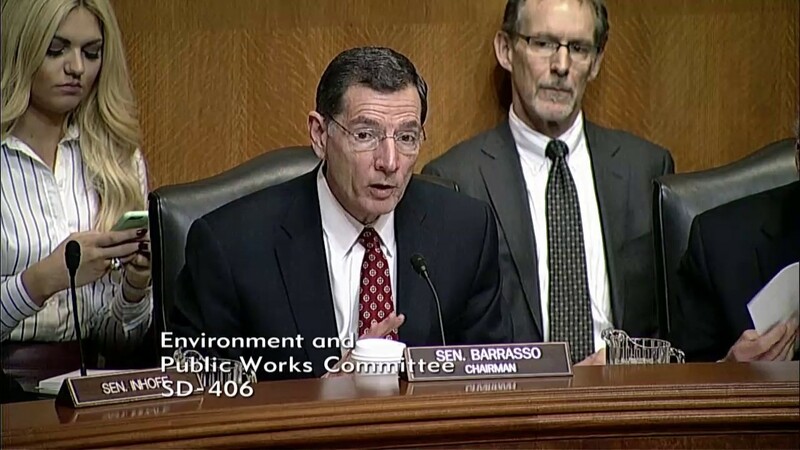 The environmental law nonprofit said that Barrasso has received substantial campaign contributions from extractive industries that wish to mine or drill land that overlaps with wildlife habitat. Citing campaign finance records, from 2011 until 2016, Barrasso received $458,466 in total campaign contributions from the oil and gas industry, plus $241,706 from the mining industry. Conservation organization Defenders of Wildlife criticized Barrasso's plan, contending that states may lack the legal authority, the resources and sometimes the political resolve to implement the ESA. "This partisan bill is all about politics, at the expense of sound science and the species that depend on it for survival," said Defenders president and CEO Jamie Rappaport Clark in a press release provided to EcoWatch. "It is a reckless power grab designed to wrest away authority from scientists and wildlife experts and give it to states that lack the resources—and sometimes the political will—needed to save wildlife from extinction." Defenders of Wildlife has multiple objections to the provisions in Barrasso's draft bill. For instance, a team overseeing the recovery of a certain species would not be allowed to have more federal members than state and local officials, who would be nominated by state governors. It also "relegates scientists, the heart of any science-based recovery effort, to an afterthought requiring majority approval by the State-dominated team," the group said. The Sierra Club similarly criticized Barrasso's bill. "Shifting from a basis in science to one blown by political whims leaves wildlife exposed, threatening to reverse decades of work to bring animals back from the brink of extinction," Jordan Giaconia, Sierra Club federal policy associate, said in a press release. "You need to look no further than Sen. Barrasso's home state of Wyoming, where grizzly bears prematurely stripped of endangered species protections are about to be trophy hunted, to see the risks legislation like this poses," Giaconia added. Further, the Casper Star-Tribune reported that the proposal will "prohibit scientific data from being disclosed in a public records request—if it includes a business or private landowner's proprietary information. Otherwise, the scientific basis of decisions with a species is to be public information." Barrasso's proposed legislation reflects recommendations from the Republican-dominated Western Governors' Association. "The Western Governors' Association appreciates the Chairman's willingness to productively engage with Governors, and that the Chairman has approached this polarizing topic in an inclusive, thoughtful manner," a February letter from the WGA states. "The proposed bill reflects this fact and offers meaningful, bipartisan solutions to challenging species conservation issues." As The Hill noted, the governors' process was bipartisan, with Hawaii Gov. David Ige (D) signing on to the recommendations. However, other Democratic governors, including California Gov. Jerry Brown and Washington Gov. Jay Inslee objected to its legislative proposals. The National Wildlife Federation—which supports the Recovering America's Wildlife Act introduced in the House by Rep. Jeff Fortenberry (R-Neb.) and Rep. Debbie Dingell (D-Mich.) in December—is pushing congressional leaders to prioritize a bipartisan effort. "The truth is that we, as a nation, could save the vast majority of species through proactive and collaborative conservation efforts on-the-ground, just as we have recovered species like deer, bighorn sheep, bald eagles, ducks, and wild turkeys," said Collin O'Mara, president and CEO of the National Wildlife Federation in a press release. O'Mara continued, "Specifically, we urge the Senate to prioritize bipartisan recommendations which bolster science-based decision-making, foster collaboration among conservation partners, and accelerate on-the-ground habitat restoration projects—and to reject recommendations that erode the scientific integrity that is the bedrock of the Endangered Species Act." Cathy Liss, president of the Animal Welfare Institute, said in a provided statement that the Endangered Species Act "does not need to be reformed, streamlined, or modernized—it simply needs to be fully funded and given the opportunity to help species achieve recovery." She added, "Congress must stop meddling with this critically important law and focus instead on ensuring it is fully implemented and enforced."